LOCATION.--Lat 41`03'55", long 75`31'17", Monroe County, Hydrologic Unit 02040106, on left bank 0.6 mi downstream from unnamed tributary, 0.9 mi downstream from bridge on SR 4002, 3.0 mi west of Long Pond, and 5.0 mi upstream from mouth. DRAINAGE AREA.--18.0 square miles. At site used prior to July 7, 1966, 16.8 square miles. PERIOD OF RECORD.--March 1965 to current year. GAGE.--Water-stage recorder and crest-stage gage. Datum of gage is 1,804.83 ft above National Geodetic Vertical Datum of 1929. Prior to July 7, 1966, non-recording gage at site 0.8 mi upstream at different datum. 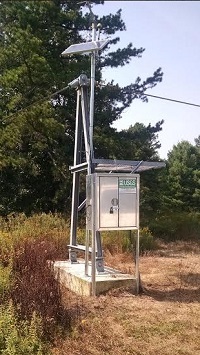 Satellite telemetry at station. COOPERATION.--Records of diversion provided by the City of Bethlehem. Station established and maintained by the U.S. Geological Survey. Funding for the operation of this station is provided by the City of Bethlehem and the U.S. Geological Survey.